There’s one thing that *officially* marks the beginning of summer for those of us in the fashion world, and that’s the start of Resort season. Cruise shows are when some of the biggest fashion houses like Chanel and Dior take their shows to far off shores for something super spectacular. This year Dior opted for something a little bit more low-key and presented their collection at the Upper Las Virgenes Canyon Open Space Preserve in Calabasas, California aka Los Angeles mountains. And while the clothes themselves were the perfect mix of western and mystic, it was the stars who showed up at the event who really left us reeling, because they looked like the grown-up sort of goth we always hoped was possible. 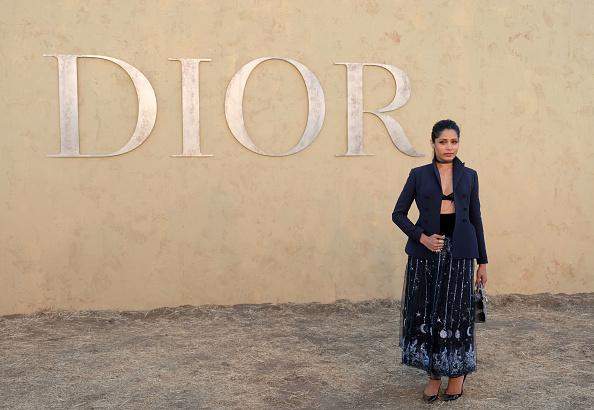 Celebrities like Freida Pinto got the “good girls gone goth” memo, choosing Dior pieces that were feminine with macabre sentiments woven throughout. Think shirtless blazers, all black and navy everything, and just the right amount of fringe and embellishment to keep the look somewhat lively. This is #grownupgoth to a tee, with the ethereal vibe that Maria Grazia Chiuri, Dior’s first female creative director, has brought to the fashion house. And of course, Rihanna was there, looking the way Rihanna always does; flawless, beautiful, and totally and utterly iconic. And of course, she had her own aesthetic in mind, going for more of a Game of Thrones meets cavewoman meets casual NYC city stroll. Brie Larson chose to adhere to the unspoken dress code, opting for an all-black outfit that was equal parts simple and striking in silhouette. We love that almost every star honored the house of Dior in some way with their look. Whether it was a nipped waist like Camilla Belle a la New Look or something totally unique like Rihanna, these celebrities, and the actual collection, definitely made Maria’s first resort show for Dior a night to remember. And a special shout out to all these ladies who helped prove that it’s not just a phase, mom!